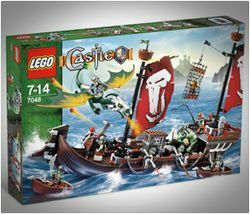 7048 Troll Warship is a Castle (2007) set released in 2008. The set contains a troll warship with two smaller boats, flick fire missiles, 6 troll warriors, a giant troll, and a dwarf trapped on a net on the ship, as well as the Lead General riding a dragon. The two-masted troll warship is that main part of the set. A large hull with a small battering-ram makes up the front of the ship. Further back is a missile cannon, which behind it is a turnable mast. On top of each of the masts are crows nests with flags on flagpoles on it. There is room for four rowers on the ship, and a giant troll with a drum goes in front of the cabin. In front of each rower on the outside in a troll shield. A small jail is placed in the middle of the ship, and a large cabin at the back. On top of the cabin is a troll warlord with a whip and another turnable mast with a net hanging off a beam. The quarterdeck is enclosed on three sides by a small wall. Also included in the set is a large green armored dragon for the Lead General to ride and two brown troll rowboats with crossbows at the front. The troll in the mini-boat. Facts about "7048 Troll Warship"
This page was last edited on 28 April 2016, at 18:17.